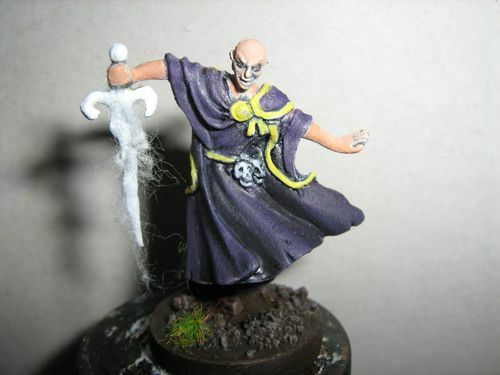 Introduction: While this hero miniature isn't part of the Conversion Kit, its Hero sheet is, and the miniature can be found in Descent 1st edition, Runebound 2nd edition, and Runewars. I'll eventually be painting and hopefully writing tutorials on the Hero miniatures that can be found in all three games for use with Decent 2nd edition. Since they're Heroes, I'll be putting more effort into painting these miniatures than the Descent 2nd edition monsters I've written painting tutorials for. However, I'm still aiming for tabletop, because I want to play with these miniatures. 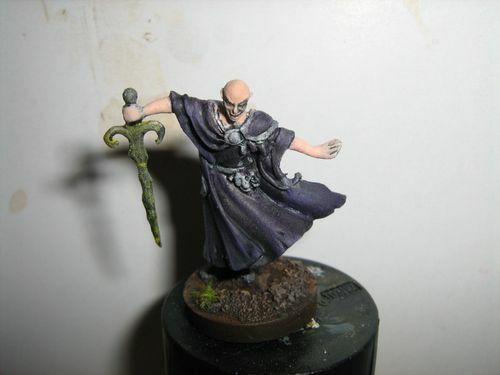 The tutorial is aimed towards new painters who want tabletop quality, without too much work. Note: The pre-shading steps for this model are the same as other figures. 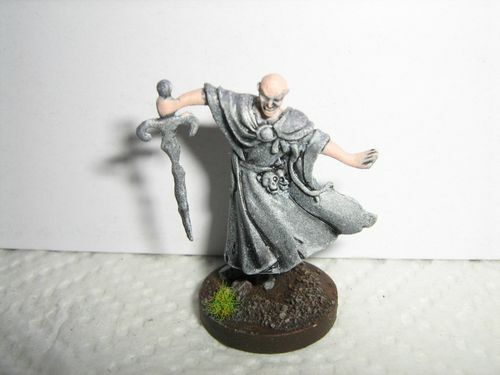 Mold Lines: Mold lines are the "lines" of excess plastic on the miniature. Cut them off with an X-Acto or other hobby knife, and small files. An engraving pen (under $10 at some craft stores) is a small handheld battery-operated "drill" with an industrial diamond-tipped head and can help remove mold lines. After removing mold lines, clean the figures in hot soapy water to remove the mold release agent, an oil, and unbend any bent plastic parts, such as swords. If you find mold lines after priming, remove them and apply brush-on primer, then color-match the figure with grey and white paints. Pre-shading: I find it easier to work with the entire figure as much as possible in greyscale, then start painting individual areas. You can pre-shade your figure this way with primer, washing, and drybrushing. Priming: Hardware stores sell spray primer, and make sure to purchase primer that says it will bond to plastic. When spraying primer, first clear the nozzle with a quick burst not aimed towards the miniature, then spray in sweeps starting a few inches to the side of the miniature. 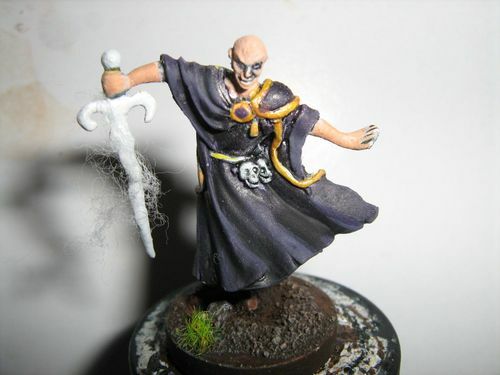 To pre-shade, first completely prime the miniature black. Then lightly coat it in grey, then white, inspecting the miniature between sprays. You want the raised surfaces to be white, and recesses to be black. 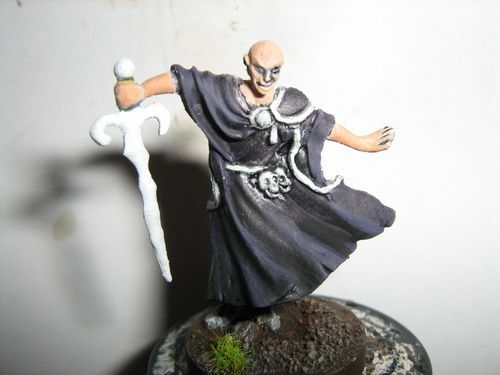 The black will give you a head start with shadows on the miniature, and the white areas will make highlights easier. Wash: Secret Weapon's Soft Body Black is an "organic" black wash, that's not as harsh as other black washes. By applying the wash, more of the details stand out. Base: The base was painted brown, sand glued to it, painted brown again, then drybrushed in light browns and greys. A dot of glue was applied then static grass. Note: Do the base after painting the boots. Flesh: Flesh paint was painted on the skin. The flesh is a bit light, so I painted it a slightly darker color later. Wash: Secret Weapon wash Amethyst, a dark purple, was applied to the cloth. 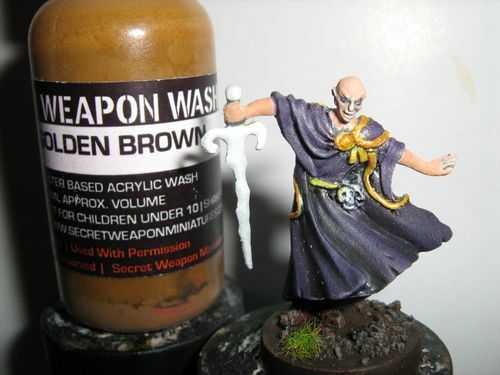 By using this darker wash on top of the black wash, we have a better idea where the shadows will be to apply the darker purple paint. Purple: Shade was quickly applied to the shaded areas, then basecoat to the other areas before the shade dried. 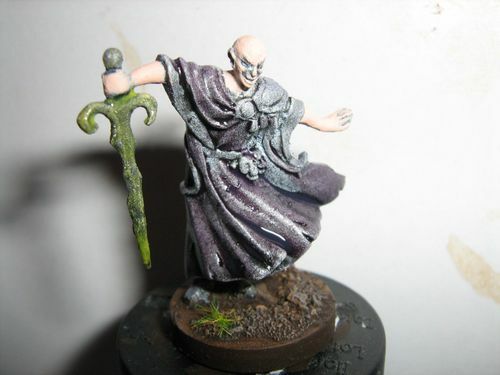 Where the basecoat and shade met, the paint was blended on the model for a smooth transition. Next, the highlighter color (you may need to mix it with a little basecoat) was applied with the edge of the brush on the raised areas. (Try flattening the end of the brush into a paddle.) 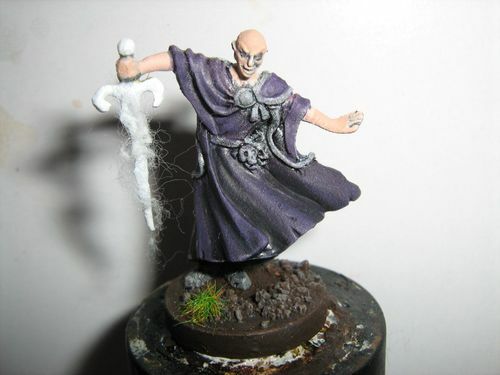 This is a fast technique, although it can only be used for models with a large area with folds, such as cloth. Note: I did this step too early. Do this step *after* painting the sword, since some of the white paint on the sword can "splatter" onto the purple, requiring a repaint! Also, do the boots before this step. Sword: The sword was painted metallic white, although white will work. As a test, I wrapped the sword in cotton to show off a "magical" effect. You may wish to paint the sword slightly darker so the cotton is more visible. White undercoat: As an undercoat to yellow, I experimented with undercoating the trim in white. However, the yellow turned out "creamier" than I wanted. Perhaps a light brown undercoat would have worked better. Yellow: Some details would be yellow, and yellow makes a reasonable underpaint for gold (although the gold areas can be underpainted in light brown). Gold: Gold areas were painted in gold then washed with Secret Weapon Golden Brown. Touch-up: Some purple and other touch-ups. Could do more work on the details, but blemishes up close aren't visible on the tabletop. Sword was painted with a little darker metallic, but is not visible with the flash.